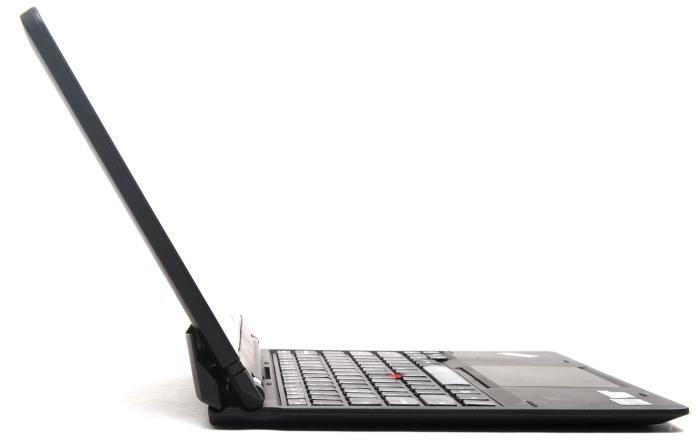 Lenovo's ThinkPad Helix is one of the best hybrid products on the market. Its tablet is fast and features an excellent screen, while its keyboard is comfortable and very well built. Some drawbacks are that it gets very hot under load and the mechanical design looks a little cumbersome. 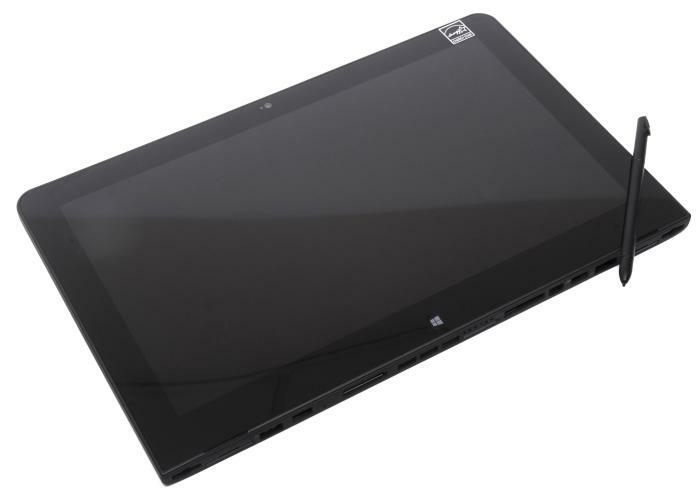 The Lenovo ThinkPad Helix (model 3698-3tm) is one of the best examples of a Windows 8 tablet that can also be used capably as a Windows 8 laptop. The tablet part of the product is excellent in its own right, but when you add the keyboard dock to it, the Helix feels very close to being a regular laptop — which is no mean feat for a hybrid (or convertible) product with separate screen and keyboard modules. With an 11.6in screen size and a Full HD resolution, the Helix tablet packs plenty of pixels and it looks sharp. It's also a vibrant screen, and because it's an IPS (in-plane switching) screen, its viewing angles are wide. Colours looked rich in our tests and the screen was bright enough to combat most reflections coming off its protective Gorilla Glass. The screen felt smooth as we ran our fingers over when using the Windows 8 Start screen and we could easily take down handwritten notes with the supplied digitiser pen. In fact, we think it's one of the best models on the market for handwriting and drawing. Hovering the pen over the screen moves the cursor, and this can come in handy when you want to see where the cursor is before starting to write or draw on the screen. It's not a heavy tablet. 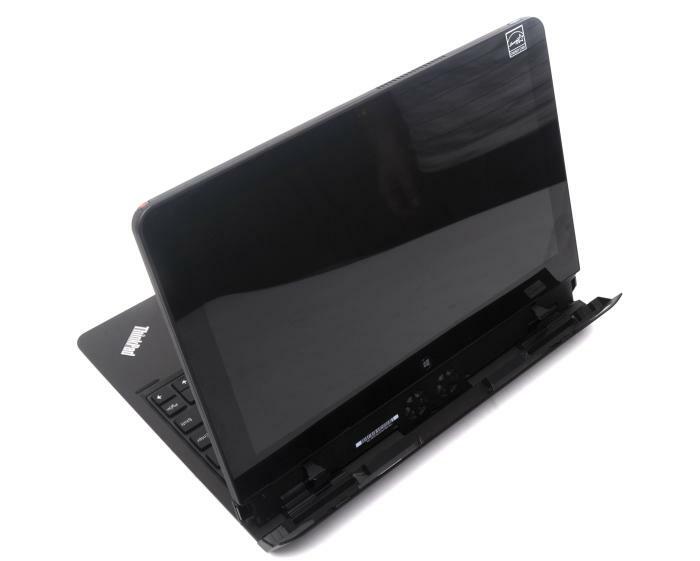 It's just 12mm thick and it can actually be classed as an Ultrabook when its keyboard dock is attached, because at 21mm it comes in just under Intel's thickness specification. On the inside, the tablet has a potent configuration that includes an Intel Core i5-3427U CPU, 4GB of DDR3 SDRAM and a 180GB Intel solid state drive (SSD). Because it's a tablet that's aimed at business users, you also get a vPro chipset, Trusted Platform Module 1.2, an Ethernet dongle and the Pro version of WIndows 8. Other features include two cameras (2-megapixel webcam and a 5-megapixel rear-facing camera), built-in 3G mobile broadband, NFC and dual-band Wi-Fi (Intel Centrino Advanced-N 6205). It's a very well stocked machine. Additionally, the tablet itself has one USB 2.0 port, an audio port and a Mini DisplayPort located along its bottom edge. Meanwhile, the dock offers two USB 3.0 ports and a Mini DisplayPort output. We wish it had an SD card slot though, just to make it easier to transfer photos from a digital camera. The side of the tablet has the combination headphone/microphone port, volume buttons, and the screen rotation lock. The bottom has the docking connectors, air inlets, Mini DisplayPort, USB 2.0, a SIM card slot and the power connector. A stylus is supplied with the tablet, and it sits neatly in the top-left corner when it's not needed. An ambient light sensor is built in to the tablet to help control the brightness according to the environment around you. It's positioned in the top-right corner of the screen and almost every time we adjusted the tilt angle, the screen brightness dipped and restored itself due to us putting our hand over it. It's not a big issue, but it could affect the way you hold the unit when using it as a tablet. As far as performance is concerned, the Helix is a mid-range powerhouse. It can be easily used for most typical office software, Web browsing and Internet communications tasks, and it will have no problems with streaming high quality video over the Internet. You could even use it to encode music and video files, and even for some image editing — it's a great mobile workhorse of sorts. A great thing about having all of the CPU power in the screen is that you can use the Helix in your lap for many hours without feeling any heat. By the same token, because the CPU and every other component that makes the Helix go is located behind the Full HD screen, you have to keep in mind that it can get very hot when it's used to process heavy workloads. Running games, for example, even something as relatively simple as Solitaire TriPeaks, caused the area surrounding the CPU at the top-right corner of the tablet to get too hot to touch. This was okay when we had the tablet resting in the dock as a laptop, but it was a problem when we wanted to hold the tablet. There is a vent at the top of the tablet, and a fan does its best to extract the warm air that is generated without getting too loud. In our Blender 3D rendering and iTunes MP3 encoding tests, the Helix recorded 45sec and 54sec, respectively. It took just under 20min to turn a DVD file into an MP4 using Handbrake. These times back up the performance we experienced during the general usage of this tablet — basically, it's a very good performer. Its graphics performance in 3DMark06 was 4341, which is par for the course for Intel HD 4000 graphics at this CPU level, while in the latest 3DMark, it recorded 2820 in mid-range Cloud Gate test and 379 in high-end Fire Strike test. You can use the Helix to play some games downloaded through the Windows Store, but be warned that it will get hot when put under a high processing load. The SSD in our test unit was an Intel 525 Series model with a 180GB capacity and an mSATA interface. It proved to be a zippy component, recording read and write rates in CrystalDiskMark of 443 megabytes per second (MBps) and 263MBps, respectively. In our own file duplication test, the SSD got 141MBps; another fast result. But apart from its performance and built-in features, the Helix shines in the area of user comfort. Its keyboard dock is hands-down the best we've used compared to the other Windows 8 hybrid tablets we've seen so far. Its keys have that distinctive ThinkPad travel and responsiveness, they are large and well spaced in a chiclet layout, and there aren't any crucial keys in weird positions. It was truly a joy to type this review using the Helix keyboard dock. It's also spill-resistant. A typically good ThinkPad keyboard is supplied with the Helix. You also get a large touchpad and a TrackPoint. 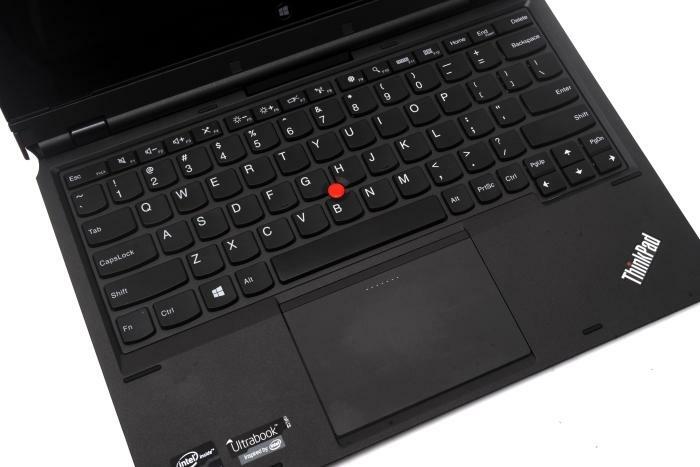 If you're a ThinkPad user from way back, you'll also appreciate the TrackPoint device, which makes an appearance at the centre of the keyboard. It didn't get in the way while we typed, and the thing was actually helpful when we wanted to move the cursor without having to move our hand from the typing position to the touchpad. The touchpad itself is a large one (100x65mm), and it has a glass-like smoothness that sometimes caught us off-guard. We had to adjust the sensitivity of the pad in the software settings in order to stop overshooting our intended marks and accidentally clicking on things. Once we did that, it was a pleasure to use; it feels very soft and responsive and it also supports swipe-in gestures to make the most of Windows 8's features. It's one of those clickpad types of pads, which means the whole thing feels like a button, and the top left and right parts of it also double as the buttons for the TrackPoint. The keyboard dock feels very strong and sturdy, and it serves up more than input devices and ports (you get mini DisplayPort plus two USB 3.0 ports at the rear); you can also use it to boost the battery life of the Helix. In our battery rundown test, in which we disable power management, enable Wi-Fi, maximise screen brightness and loop an Xvid-encoded video, the tablet on its own lasted 4hr 11min, which isn't too bad for a Full HD tablet with a Core i5 CPU. With the dock attached, we got 6hr 16min in the same test — a useful gain. You can get more from these batteries if you employ a sensible power management plan, but it will depend on the tasks you run, too. You can place the tablet in the dock facing towards the keyboard, like any regular clamshell laptop, or you can reverse it have the screen facing out. This allows you to fold the screen back over the keyboard, which is a nifty way to carry the dock when all you want is the extended battery life but not the laptop form factor. It does add to the weight of the unit: the tablet on its own weighs 854g while the overall weight with the dock is 1.689kg (at 834g, the dock is lighter than the tablet). One thing we love about the reversible screen position is that you can use the dock as a stand for the screen if you want to watch videos. We had lots of fun using it this way to watch NBA playoff games through NBA.TV. Here's the Helix sitting with its screen facing outwards. Mechanically, the dock has plenty of moving parts and it seems a little clumsy. 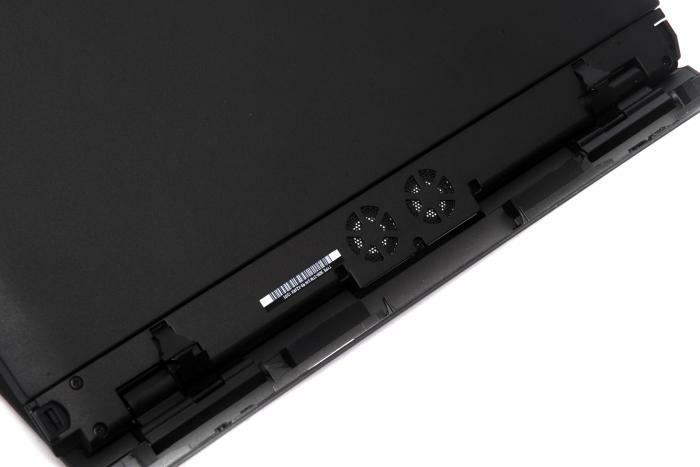 There are pins on the hinge that hold the tablet in place on either side, while a latch mechanism keeps it secure. It's relatively easy to remove and turn the tablet around when you want it facing the other way and the hinges are strong enough to hold the tablet firm at any angle. It doesn't tilt back too far, which is a good thing considering the base is lighter than the tablet. There is a flap on the rear of the dock that makes the whole thing look and feel a little cumbersome. It's a flap that rises as you lift the lid on the Helix when it's in laptop mode and tilt it back. It serves the purpose of keeping the tablet cool while it's docked, and it does this by providing a channel of clean air for two little fans that blow air up through the tablet. It's an innovative design, but as one co-worker put it to us, it's not "child friendly"; not only because it seems like it could break off easily, but because it could potentially become a finger trap. The flap at the bottom opens up and exposes the cooling system. Here's a closer look at the fans. Balance is a key issue with many of the Windows 8 hybrids that we've seen so far, with many being a little too top-heavy. The Helix is top-heavy, too, which is understandable given that there is a whole Core i5-based computer sitting just behind the screen, but Lenovo has done a good job with the dock, making it so that it sits reasonably comfortably on a lap. This is to say that it won't easily topple over backwards if you take your hands off the keyboard or knock the screen. However, if you use it in your lap with your knees slanted downwards, all bets are off. The tablet sitting in its keyboard dock and leaning all the way back. At around $2600, the Lenovo ThinkPad Helix is not a cheap hybrid, and most of us who have become spoiled by ultra-cheap laptops might balk at the price. However, it's a high quality product that offers responsive performance, in addition to a user comfort level that we think is very valuable. It's an especially good unit to consider if you want an always-connected Windows 8 tablet, too, thanks to the built in SIM card slot (full sized) and 3G capability — great if you don't want to use a separate USB dongle or your phone as a hotspot. All up, the ThinkPad Helix is an innovative and high-quality hybrid product from Lenovo that we think does a good job of marrying comfortable notebook features with a zippy tablet. It can get too hot to touch at times, and its dock design is a little different due to its cooling system, but we like it a lot. 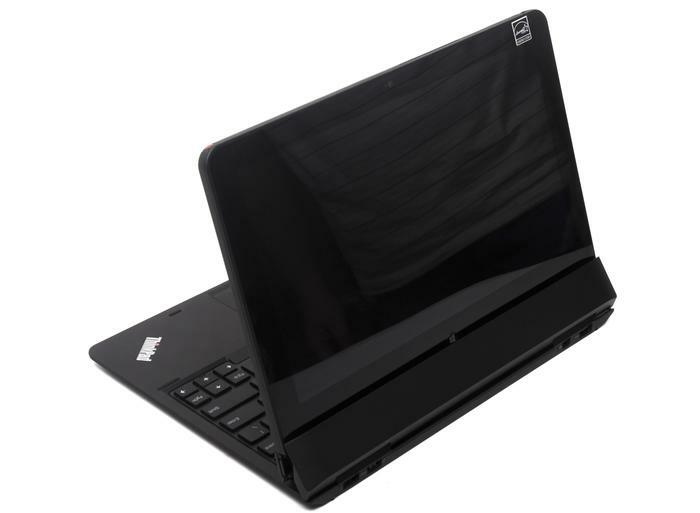 It's a top unit to consider if you're someone who needs a Windows tablet and a notebook and would love to have both in one capable and comfortable unit.